a bottle or feed a child in this way as all mothers breastfeed their children. In most cases, loving family members, oftentimes a grandmother or aunt, care for the babies following the death of their mothers. Unfortunately these women and family members are not able to support this expensive formula that the babies desperately need the first year of their life. In addition to orphaned children, we also assist twins and triplets who have a living mother by providing infant formula as a source of supplementation until their mother can provide what they need to support their nutritional needs exclusively through breastfeeding. 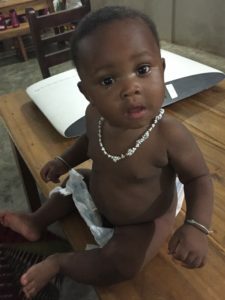 Sponsorship through this specific program creates the possibility of providing formula to these babies throughout their crucial first year of life. Therefore, it really offers the possibility of a thriving life. Each of these babies and their caregivers visit our center in Sakété once a week to ensure they are growing properly and during these visits they are given a large can of milk formula to sustain them for the following week. It is a joy to see these babies grow and thrive with adequate nutrition! Sponsorship through this specific program creates the possibility of providing formula to these babies throughout their crucial first year of life. Therefore, it really offers the possibility of a thriving life. Each of these babies and their caregivers visit our center in Sakété once a week to ensure they are growing properly and during these visits they are given a large can of milk formula to sustain them for the following week. It is a joy to see these babies grow and thrive with adequate nutrition! Cynthia was brought to us by her maternal grandmother when she was two-months- old. Her mother died in childbirth and unfortunately her father did nothing to provide for her or her two older siblings. 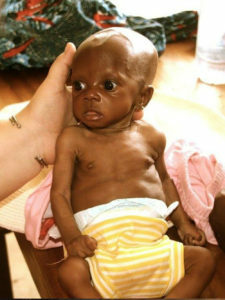 Cynthia had become incredibly malnourished and ill when her loving grandmother brought her to the local hospital. It was there that the hospital’s social worker contacted us and her grandmother brought her to our center once she was discharged. 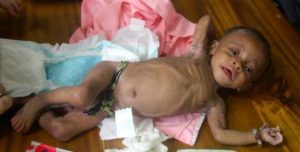 We realized immediately that this frail, 5-pound infant required our immediate intervention. Since the day we first met Cynthia, Tree of Life USA has been providing powdered baby formula for her and educating her grandmother and aunt on how to properly administer it to her. We are so thankful that Cynthia began growing very well and thriving with this proper nutrition! 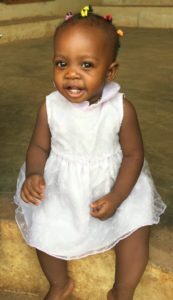 It was through sponsorship in our Infant Formula Program that she received milk formula throughout her entire first year of life. We are overwhelmed with joy to report that she is now a happy, healthy toddler.